Known for his ever-present smile, Steve sticks out as one of the friendliest folks in an already super-friendly crowd. He’s a long-time Pacer and 10-Mile Challenge Assistant Coach now leading runners to double digits. 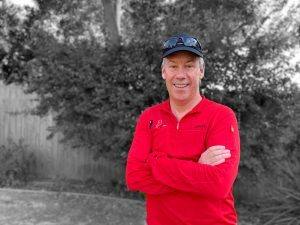 Sometimes referred to as “Safety Steve” for his personal mission to keep runners safe on the roads, Steve always has kind words or sage advice to share along the route. I started around 2007, so more than ten years. My weekend cycling partner took up golf, so I was looking for another Saturday morning athletic activity. My dear friend Steve Smith suggested the Pacers, and the group was so welcoming that I immediately felt at home. Tell us how you got started as a coach. After going through the Pre-Conditioner group four times (It’s a whole story…! ), I completed the 10-Mile Challenge, thanks to the coaching of Wende Lee and the encouragement of Lorraine Lerner. Next, I joined Coach Ezra’s group and ran my one and only half marathon (the Pasadena Half in 2012). Not wanting to do any more races, I returned to help Wende coach the 10-Mile Challenge, along with Kit Cole. What keeps you coming back to the Pacers? The fellowship and the exercise, in that order. Tell us about an amazing Pacer memory. This isn’t necessarily “amazing,” but more instructive. One Saturday I planned to run eight miles, but a fellow Pacer didn’t know the route for his longer run, so I ran with him all the way to Descanso Gardens. Unfortunately, the water there was all gone and I had no food. Thanks to the generosity of other Pacers, they supplied me what I needed for what ended up being a 12-mile run. It taught me valuable lesson about being properly prepared (and supplied). While the talent of the leadership is quite high, the Pacers as a group are encouraging, and not competitive. There are runners of all skill levels, but no one is comparing themselves to anyone else. We are all here to try to improve, with the help of others. Plus, it’s an incredibly generous, open-minded group—I’ve had some deep conversations about politics and religion while running with other Pacers, and everyone is accepting and open to others’ points-of-view. Tell the folks why they should join the 10-Mile Challenge. I serve on the Board of Trustees for San Marino’s Crowell Public Library. Read, teach at LMU, help my wife in her classroom, ride my bike, work in my garden, spend time with my kids and my 93 year-old dad. Average pace: around 11:00 or so, including walk breaks. Favorite food: Yes. Food is my favorite. Family: fantastic wife, two amazing children, great son-in-law, and a daughter-in-law in June 2019! Job: I am a management consultant, specializing in marketing and communications. Running mantra: Relax, and run smoothly.